Girls War is a card game (a deck-building game, to be precise) about the world of Japanese girl Idols. 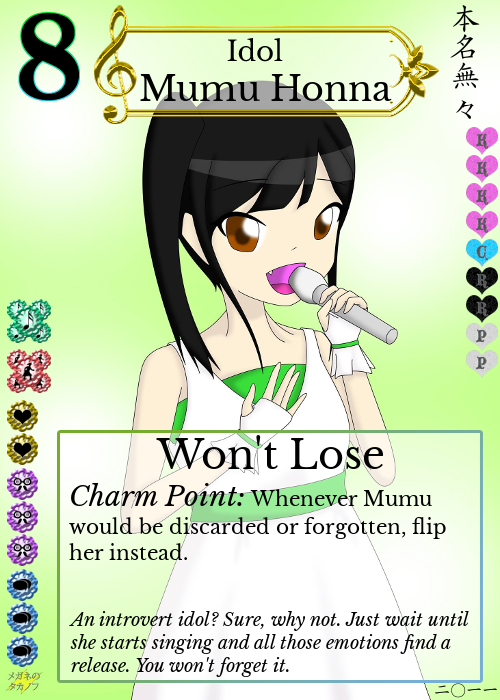 The final version of the game will have about 120 unique cards, 36 of which are Idols. We're currently looking for artists to illustrate those cards. This is not spec work; you'll be paid, although not necessarily too well, since, well, we're new. 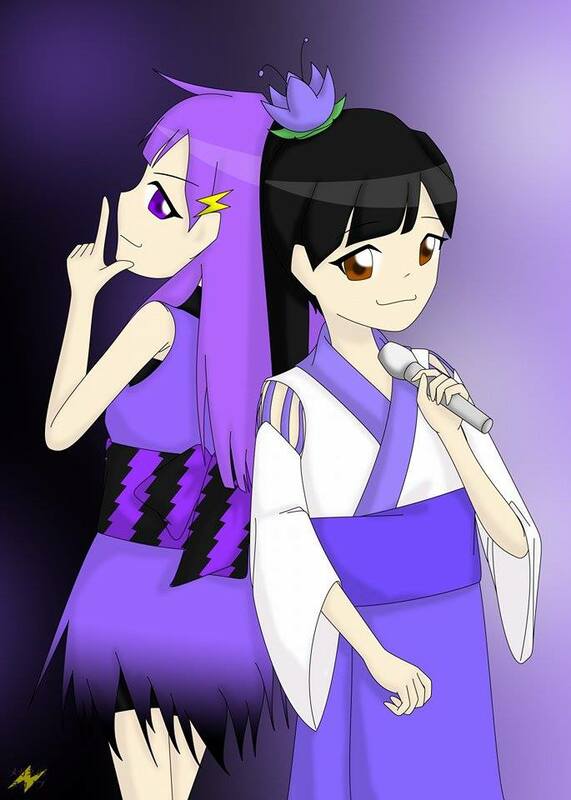 Manga/anime style, colour. The specifics are up to you, but aim for cute. Cards are poker format, 3.5 by 2.5 inches (that's 89mm by 63.5mm in reasonable international units). Art will be full-bleed, that is, it will form the card's background, with all game information overlaid on top. The top area will have the card's cost, name, and type; the bottom half (more or less) will usually have some text on a translucent background. So the most important points in your art (e.g. Idol faces) should be in the top half, but some distance from the top edge. That said, for each individual card you'll be given the exact overlay, so you can know exactly how to use the space (except that some cards will have placeholder names). The background for the art itself shouldn't be too complicated, at least for Idol cards, so it doesn't cause confusion with the game elements (flowers and hearts seen in the samples below, and the big number in the top left corner). The bottom left corner is reserved for your signature. Please don't put it anywhere else, and don't make it larger than in the samples, or it will end up being partially covered. The game is about human girl idols, in a real-life-like setting, who are usually between 12 and 20 years old, and is set between 2008 and 2012. Idol cards should depict the idol. 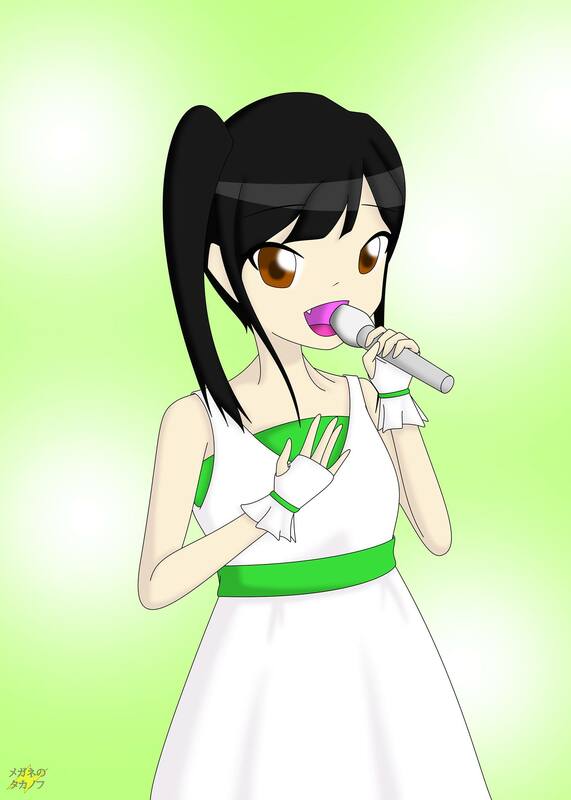 Some Idol cards are homages to existing (real-life or fictional) idols, so you'll be asked to draw based on that; but not an exact likeness (because we obviously don't have the rights for that). Others might be original characters, depending on backer feedback. Staff cards should also have the person in question as the main feature, and resource cards should depict the item described in the card. For other cards (upgrades and activities), interpretation will be up to you, although we'll be available to brainstorm if you want. 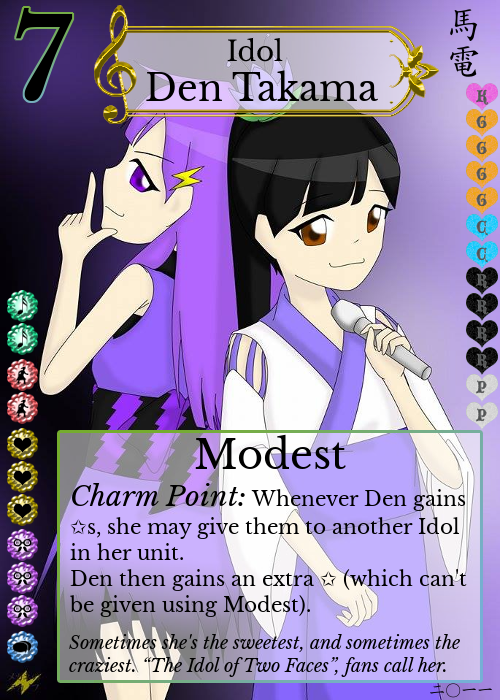 We'll agree in advance on a number of cards, with a given distribution of Idol/staff/other cards. Then we'll agree on a flat fee for that. There will be an actual contract that both parties will sign (and of which both will keep a copy, of course). We'll need one sample card in advance, both in order to judge your fit, and more importantly, to show supporters what the game will look like, when we launch the crowdfunding campaign. If you can make two, that would be super awesome; but no need for more than that. Should the campaign fail, we'll pay you a small amount, which we'll also agree to and set in the contract; you won't draw anything more than the one or two samples, and you'll retain the rights to those as well. Keep in mind we'll be paying all artists out of our own pocket, so the payment for each won't be much; we'll do what we can to be fair. There will be a penalty fee should you not be able to finish the work in the agreed time. You may request specific cards (e.g. the Idol based on your own real-life favourite), but those will go on a first-ask basis. If the card you requested ends up not existing in the final game, we'll give you a different card of the same type. In order to be paid, you will need to send us an invoice. So if you've never done that before, please look up the legal requirements in your country/state/province. If you're under legal age, you might need a legal guardian to co-sign it. If you want to contribute without being paid, rest assured you'll be credited (with link), and we'll send you one (or a few) copy(es) of the final game for free; but this option is mostly for people who for some reason can't make an invoice, or something. In principle, we're aiming for paying everybody. To apply, email us a link to an online portfolio (even if it's all fanart); or just go ahead and draw your sample card based on one of the templates below. Don't despair: you can instead look for us on twitter. Send us a @mention, then follow us, and we'll DM you the correct address. Or just @mention us the portfolio link and let us know it's an application. The font used in the psd/xcf files is Libre Baskerville. Bear in mind the card layout is not final, although it's getting pretty close.